Some new Forex Swingtrades have either just triggered in or are about to. I’ll get to those in a moment. But first, Futures were simply great again today with Trend Jumper. Following the same markets, we achieved winning results across the board as Trend Jumper pretty much ran the table. Some of our tradeplans were super easy while others did require a little bit more work. Here are the Highlights. Nasdaq eMini NQ: +.5; 1 for 1 for only $10; this trade missed its full target by 1 tick which qualifies for full target poq. Had to stop. Unfortunately the 2nd trade was a full winner but that’s the way the cookie crumbled today with NQ. On the forex side, my favorite way to trade forex is with daily charts. The reason is because it fits my lifestyle so well. Here are the results for 2012 swingtrading my favorite forex pairs with Trend Jumper. Keep in mind that I used the exact same tradeplan for each pair and that Trend Jumper is so easy and so flexible that all I had to do was put it on each chart and then.. GO! No optimizing! There almost was a losing result, and in fact, ironically, it was with the most popular pair of all, the EURUSD. However, like we saw late last year, the EURUSD is starting to really move. Trend Jumper picks up a fast winner where the first half of the position came off at the full target and the 2nd half is still trailing. It is also building a position as it just added to its position today. Check out the current chart below. it appears that it will be very difficult to make money with trend jumper on futures if one can only trade 1 contract. have you done any calculations for those who can only trade 1? Actually, you can do quite well with just one contract. The fixed target is a high percentage winner on most markets. We recommend that new traders begin with only 1 contract anyway and as they grow their account and get more proficient with the method, then think about adding a 2nd trailing position. I personally think Trend Jumper is an excellent strategy to use for one position traders, so you’re in luck! Ok, but the trade re-caps I have seen, it seems like it takes the runner to make up for stops. In other word, it would take 2 winners to make up for 1 loser if all you did is take the fixed target, whereas with a runner, you can be profitable with 1 loser and 1 winner. You are basing your opinion on just a few sample trades. Don’t forget, often a trade will stop out and you’ll get a full loss on two positions. Then you’ll get a trade that hits the full target for a winner and then retraces to stop out of its trailer with only 1 tick. So you would have a full loss on two positons, but only a full winner on 1 position. Much depends on the size of the trade, too. 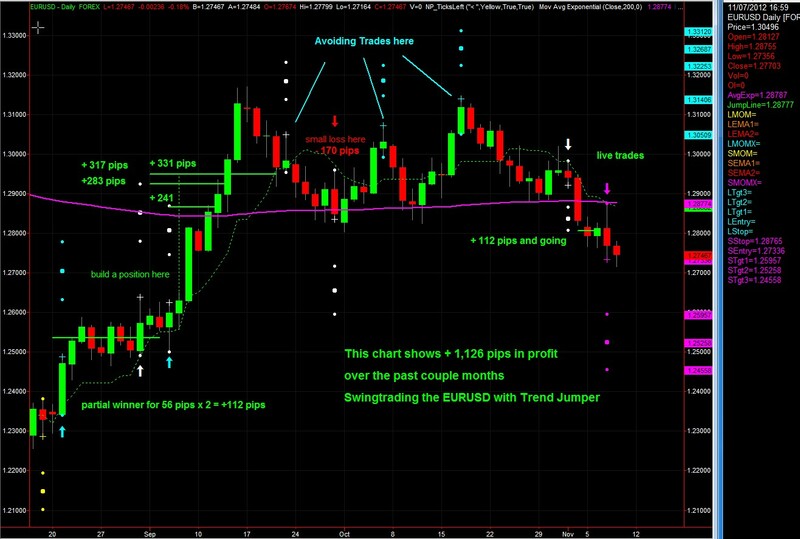 A single position trader can do just fine trading to the fixed target with Trend Jumper. Do you want to trail at some point? YES! By all means its something worth building up to. But it is NOT necessary to succeed with this strategy. Some traders will never use the trailer and that’s fine. I show the two position approach on everything because I use that as a baseline. I did design the strategy to accommodate multi position traders as well as single position traders. do the arrows on this indicator repaint? No, Jude. There are NO arrows. There are dots and symbols that show the trade setups but not arrows. The arrows you see are put there by me, when I am marking up a chart to show stuff. The trade setups themselves require the bar to close to be valid and once the bar is closed, they are there, for good or bad. No repainting.